For semiconductor stocks, 2018 turned out to be a forgettable year thanks to headwinds such as weak chip demand and the U.S.-China trade war. As of this writing, the Philadelphia Semiconductor Sector index has lost around 4% of its value in 2018, and it looks as if the market won't be picking up a lot of momentum in 2019 either. 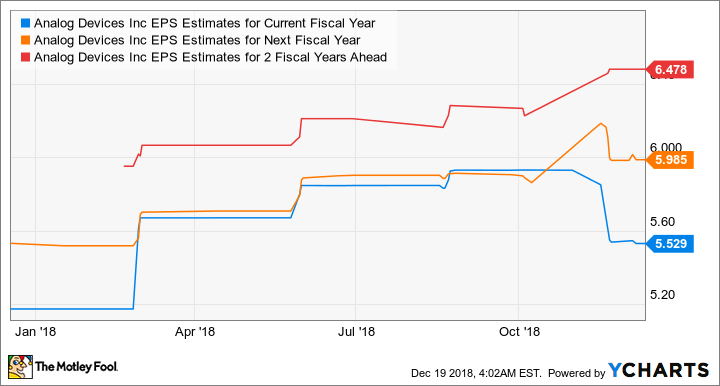 IHS Markit predicts that semiconductor sales will increase just 4% in 2019, down from 2018's estimated growth rate of nearly 15%. However, Analog Devices (NASDAQ:ADI) has weathered the chip industry slowdown, with its stock flat so far this year, which showcases its resilience in the face of the broad market weakness. But it won't be surprising if Analog breaks out in the new year, as it is going after markets with a lot of growth potential, and also pays a nice dividend that it has been raising consistently for the past 14 years. Let's see why this underrated chipmaker should be on your new year's shopping list. Analog Devices is coming off a solid year. The company's revenue shot up 19% in fiscal year 2018 (which ended on Nov. 3), while net income more than doubled on the back of impressive growth in its margins. Analog's $15 billion acquisition of Linear Technology (completed in March 2017) was the biggest catalyst behind this attractive financial growth. Analog spent handsomely on Linear because the latter complements its existing businesses. In fact, the combined company achieved $150 million in cost synergies in fiscal 2018, and it is now looking to save another $100 million in costs going forward by reducing its manufacturing footprint. But that's not the only upside that Analog is looking to achieve. According to CEO Vincent Roche, "Given the complementarity of our combined product portfolio and customer relationships, we're increasingly confident in our objective to double LTC's revenue growth over the next few years. We exit 2018 in a stronger position than we've ever been and are extremely well prepared strategically and operationally to grow and take market share in 2019 and indeed beyond." For instance, Analog is now in a stronger position to tap the growing demand for semiconductors in the industrial sector. IHS Markit points out that after the Linear Technology acquisition, Analog became the second-largest industrial semiconductor provider, after Texas Instruments. That's a nice position to be in, as industrial semiconductor sales increased nearly 12% in 2017, and the industry is expected to keep growing at a compound annual growth rate of 7.1% through 2022. Not surprisingly, Analog Devices is going aggressively after this opportunity. It recently announced a range of solutions aimed at helping industrial equipment OEMs (original equipment manufacturers) move toward automation faster. For instance, Analog's condition-based monitoring system aims to improve machine productivity by reducing downtime in industrial and transport equipment. The chipmaker uses its sensor technology to monitor early signs of failure or fatigue, helping factory managers carry out preventive maintenance and boost productivity. These solutions will help Analog tap into fast-growing niches of the industrial semiconductor market, such as factory automation, which is expected to grow at 8.8% a year through 2025. This bodes well for Analog, as it gets half of its revenue from the industrial business. At the same time, its bottom line is on track to improve thanks to the higher-margin profile since the Linear Technology acquisition. Analog Devices exited 2018 with a gross margin of 68.3%, which is a massive jump from the prior-year period's 59.9%. Looking ahead, Analog's margin performance will improve further on the realization of more cost synergies. I have already mentioned that Analog has a solid dividend payout history, which is unlikely to change because the catalysts Analog enjoys should boost its bottom line. 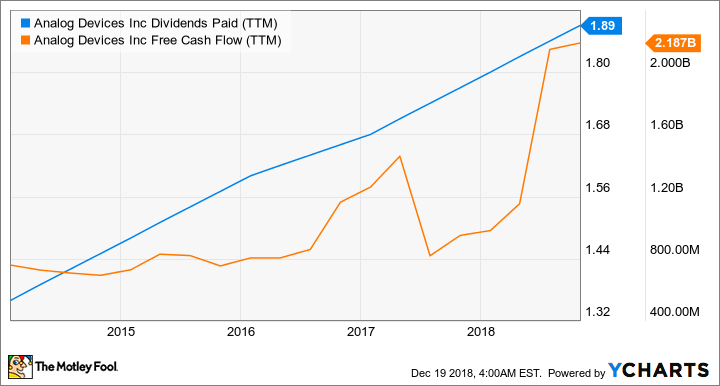 More importantly, the company is committed to returning all of its free cash flow to shareholders after debt repayments, and that's an important reason its dividend payments have increased over the past year. ADI Dividends Paid (TTM) data by YCharts. Looking ahead, Analog's earnings are expected to get better, as evident from the chart below. ADI EPS Estimates for Current Fiscal Year data by YCharts. It won't be surprising to see the company's free cash flow profile improving. This should allow it to sustain its dividend hikes and boost the yield that already sits at an impressive 2.22%, ahead of the tech sector's average yield of just 1.08%. Finally, the stock trades at just 15 times next year's earnings, which is half of the company's five-year average price-to-earnings ratio. So investors looking for a nice dividend-paying tech stock that will help them take advantage of secular growth trends in the semiconductor industry should definitely take a look at Analog Devices. Check out the latest Analog Devices earnings call transcript.